Kathleen Hicks, deputy under secretary of defense for strategy, plans, and forces, has served at the Pentagon off and on since 1993. But it was not until last February that she walked into a Defense Department office and found herself in a meeting in which all of the attendees were women. "It was the under secretary, a deputy, a military officer, and some career civilians. And, to a person, everyone around the table was female," says Hicks. After 15-plus years in the defense field, "It was absolutely stunning." The ranks of American women in defense have grown over the years. Michele Flournoy, the under secretary of defense for policy, is the No. 3 civilian in the Office of the Secretary of Defense, outranking, in the Pentagon's complex organizational tree, all of the U.S. military combatant commanders, including Gen. David Petraeus. Women now make up 37 percent of the Defense Department's civil labor force and about 12 percent of its active-duty military ranks. It has been a gradual shift, and many of the women in the building today have stories to tell about their early Pentagon years. In 1997, Hicks, then 27, recalls landing at a Marine base on Okinawa in Japan as part of a Pentagon delegation. "We got off the plane, and a Marine general officer shook our hands. Then someone stepped up to me and said, 'We have a car waiting for you, Ms. Hicks. You're going on a shopping trip with the spouses.' I stood there thinking, protocol-wise, what do I do in this situation?" Hicks adds that it's possible that even though the base's brass knew who she was, they still assumed she would want to go shopping. "You don't even begin to know what they're thinking." The general she was traveling with stepped in and said he was certain that Hicks, as the subject matter expert, would opt to skip the shopping. Coming up together in the defense world, from the Pentagon to Washington think tanks and back again, Hicks and her female peers often called upon one another for advice and insight. Christine Wormuth, the principal deputy assistant secretary of defense for homeland defense and Americas' security affairs, worked with Hicks and Flournoy at the Pentagon in the 1990s. Back then, she says, as a relatively small group of women in defense policy, they would brainstorm about their jobs and how to balance work with family. Pregnant pause. They commiserated as well, and liked to joke that being a woman in the Pentagon was much like being a talking dog--an impressive anomaly that colleagues often didn't know quite how to handle. One of their favorite stories, Wormuth says, involved the 1997 Quadrennial Defense Review when Flournoy was "very pregnant" with her first child. "QDRs are often very contentious processes here in the department. Michele was calm but was having a very intense discussion with a one-star general." The general "very much wanted to get in her face and use his physical size to intimidate her," Wormuth recalls. But he couldn't: "Her stomach was blocking him." Colleagues describe Flournoy as both relaxed and supremely competent, and few were surprised when President Obama tapped her to head the Pentagon policy shop. "We were always trying to figure out her secret," says Janine Davidson, deputy assistant secretary of defense for plans. A former Air Force pilot and the first woman to fly C-130 planes, Davidson jokes that women in the building often sigh and say, "If only we could be more like Michele. We tell male colleagues, 'You know, we're not all like that. We're not all that calm. Some of us yell.' "
It's a relief, Davidson says, that "with this many women in the building, you're allowed to have your own personality, your own style. 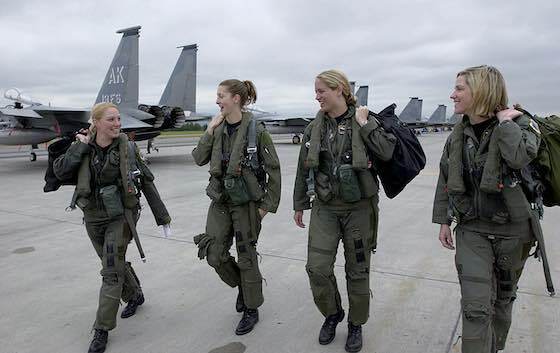 When I was the only woman flying C-130s, whatever I did spoke for all women." Davidson recalls her first assignment on Okinawa, when she was the only woman in her squadron. "The guys all treated me like their kid sister. That wouldn't be tolerable for me today, but I was 23, and it worked out." She had been told that the enlisted men in the flight crew wouldn't accept her. "What I learned right away," she says, "is that when you demonstrate you're competent, they're fine." It is a considerable step up from copilot to aircraft commander, but many of her fellow pilots had been tapped for the promotion. One day, some of the enlisted crew members approached Davidson and asked her, "Why aren't you at aircraft commander school?" Davidson responded, "I guess I'm not ready yet." The enlisted men, Davidson recalls, told her, "You're one of the best copilots here. They're not giving you a fair shake because you're a woman," she says. "I was like, 'Oh, crap.' "
She approached the operations officer. "I said, 'Hey, I find this hard to believe, because you guys are so great, but people are telling me that the reason I'm not at [aircraft commander] school is because I'm a woman. I'm trying to think about what else it would be.' " The chief pilot told her, "You've kind of plateaued." Davidson says that it was then she realized that she'd never flown with the chief pilot or another senior officer. They scheduled her to fly with them a few days later. By the following weekend, she was on her way to aircraft commander school. Blind spot. "I think sometimes the men don't realize that they're doing it," Davidson says. "It's a fine line between having a chip on your shoulder and thinking that everything bad that happens to you is because you're a woman--and being naive and needing people to come up to you and say, 'Look, chump.' "
As civilian leaders who interact regularly with the military, Hicks and others add that the early obstacles they faced at the Pentagon were often more likely to be a result of their youth than their gender--in particular, being subject matter experts in their 20s who tended to work with more senior officers. Once you proved you knew what you were talking about, Hicks says, "people were very willing to throw good work at you." There is a meritocracy, she adds, that is part of a Pentagon tradition of bringing in "whiz kids" to troubleshoot complex problems. Today, Hicks notes, "I don't want to overpraise, but there is a lot to be said for how far the military has come" in accepting women into that tradition. Still, some hurdles remain, including "general work-life issues" that can separate civilian officials, both male and female, from their military counterparts. "The Pentagon is dominated by a military culture that is a culture of sacrifice, of giving 120 percent," Hicks says. There is a generation at the Pentagon "trying to fit more time in for family, for personal time--whether it's exercise or something else--that comes crashing into a 'can-do' attitude within the military that tends to drive very long hours and generate an exceedingly high quality of work. You don't want to change that can-do attitude." But it can be a challenge for civilians, and the majority of the women who come to Hicks and others for advice ask about how best to balance family and work. "Every year, it gets better and better," Hicks says. But there is, too, the less discussed reality that the Pentagon is at heart an institution in the business of war, and women are not permitted on the front lines of combat. It raises the question of whether women can truly rise to the top echelons of the Department of Defense. "I think in some numbers, the answer is yes. As a class, it will not be until we recognize that women are able to do, by and large, all that their compatriots can do, as long as they are held to the same standard, that you will see a true shift," Hicks says. "I think the appetite is there." Today, says Davidson, it is helpful having women who have experience in the field as role models. "I've never really had women mentors like this before. There weren't really women higher ranking than me because they hadn't been able to fly," she says. "It gives you this confidence at a subconscious level; I think it does that for a lot of women." Adds Wormuth, "The fact that you see more women at more senior levels is a consequence of the fact that we have grown and developed. I certainly hope it sends the message to younger women just starting their careers that 'you can do this.' "
Woman to Woman: "Woman's Place Is at the Pentagon"